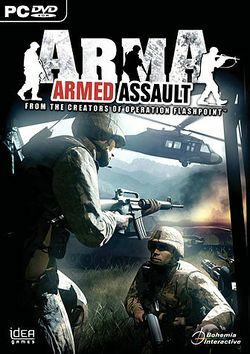 ARMA: Armed Assault (also known as ARMA: Combat Operations) is a tactical shooter released in 2007, and developed by Bohemia Interactive. The game is an update to the game engine originally used in Operation Flashpoint, featuring minor improvements. The campaign is set in the fictional island of Sahrani, home to two states. Soon after the start of the campaign, the Kingdom of South Sahrani received a surprise invasion by the northern Democractic Republic of Sahrani when the United States was withdrawing its forces from the area. This page was last edited on 20 February 2018, at 07:33.